Enjoy walking and talking? Sue Hedlund leads the “Walk & Talk” Small Group on Mondays from 5:30 – 6:30 PM, starting in September. They meet at the Stillwater Area High School and walk outside as weather permits, then move inside later in the fall. The group is open and anyone can begin at any time. They walk for about 45-50 minutes. Any walking pace is welcome! It’s a fun and supportive group! Experience God’s Presence through the practice of yoga. Some call it a time of prayer, some a time of worship, some a time to simply be present to God in a new way, and experience an increased sense of God’s Presence in the midst of busy lives. 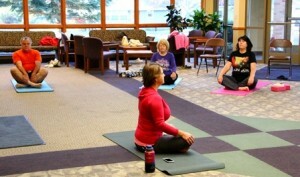 Six week sessions of yoga begin throughout the year. Classes are held on Saturday mornings at 9 AM. Blood pressure checks are available the third Sunday of the month in the Parish Nurse’s office. Checks start at 9:00 AM.